I Liked everything about kosy. I recommend this hotel, the rooms are clean and comfy. 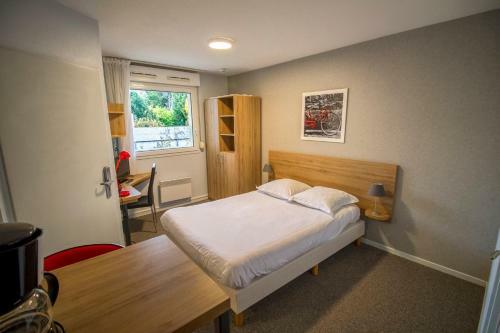 Simple accommodation, inexpensive, reasonably clean, within walking distance of a supermarket, a few attractions and champagne houses. Downtown and the main train station aren't too far away either if you're not dragging a suitcase. There is a large fridge in the room not pre-filled with some crazy stuff which you can use for cooling champagne:) The hotel itself is located near the ancient Roman arc/gates and the train station. The place was at a very good location, clean and comfortable. The Mumm cellars is just across the street - a very good option for travelers and champagne lovers. There is Aldi and Carrefour very close. Also the city is just 10-15 min walk. The main station also ca.10 min walk. Even after working hours I was allowed to check in - my key plus a helpful instruction was left in a safety box. Very easy and convenient. Thank you! We met no staff at all so we could not access any parking. There was a “mad loud party” upstairs on Saturday night. 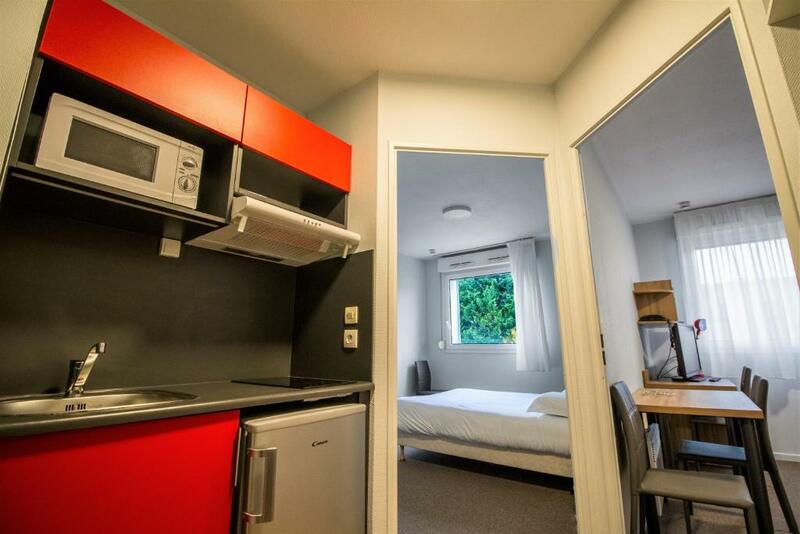 Parking, kitchenette was small but adequate enough to cook in and prepare food. 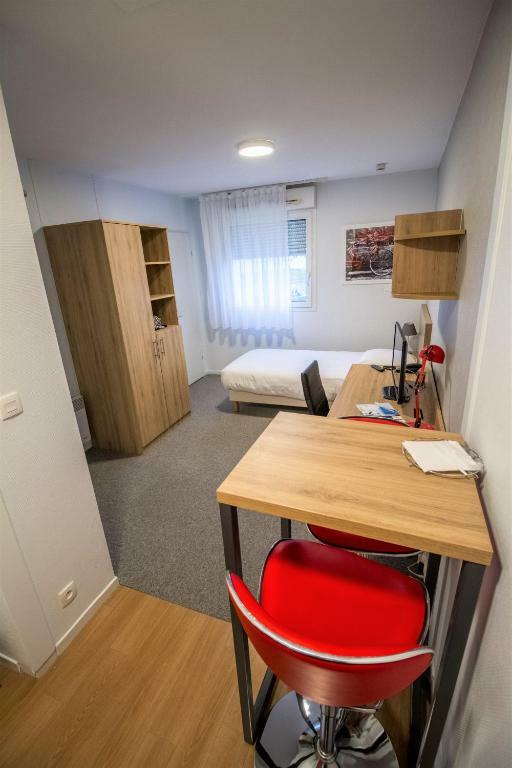 Compact and functional.Nice warm clean room with comfortable bed.Great for short stay while travelling.Easy walk to city. Supermarket near by.Free on street parking. I picked this hotel as it is across the road from G H Mumm where we did the afternoon champagne tour. From the hotel into the centre of Reims was about a twenty minute walk, for the Cathedral, bars and restaurants etc. The hotel is not manned on a weekend and on arrival we could not work out how to raise the door to the car park, so we parked in the parking slots at the roadside outside. Convenient for city sites. Free parking on street. 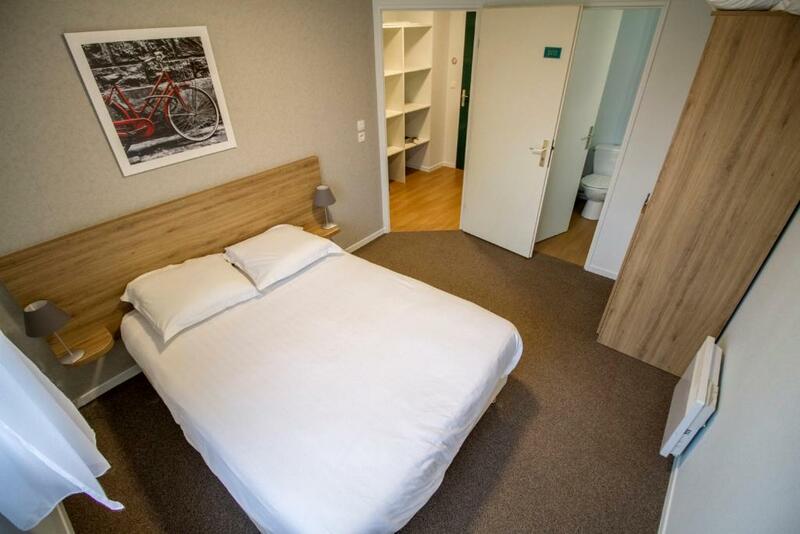 Lock in a great price for Appart Hotel Reims Champ De Mars – rated 8 by recent guests! Set in central Reims, the Appart'Hotel Champ de Mars is a 10-minute walk from the train station and a 10-minute drive from Reims Convention Center. It offers furnished apartments and studios with free Wi-Fi access. 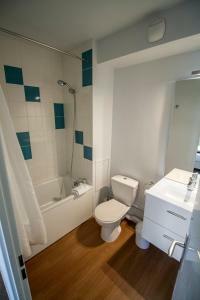 Each of the apartments in this quiet area has a fully equipped kitchenette, a telephone and TV. A cleaning service is also available. Guests can relax in the lounge area. A buffet breakfast is available from Monday to Friday upon request. 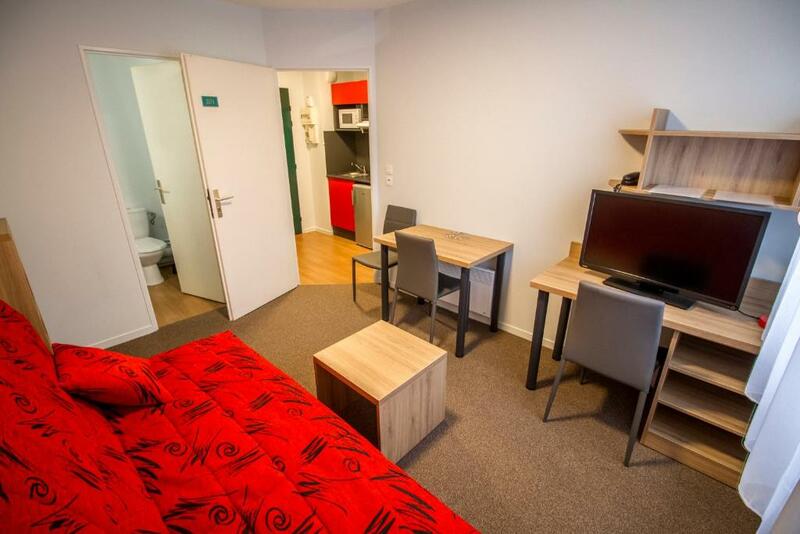 Reims’s old city center and its famous Cathedral are a 20-minute walk away and a private garage is available. You can also visit the cellars of prestigious Champagne houses, including Pommery, Krug and Mumm, located opposite the residence. Reims Exhibition Center is 20 minutes away by car. 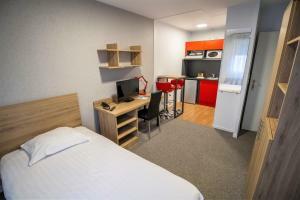 When would you like to stay at Appart Hotel Reims Champ De Mars? Studio for 2 adults featuring a coffee maker, microwave and fridge in the kitchenette. 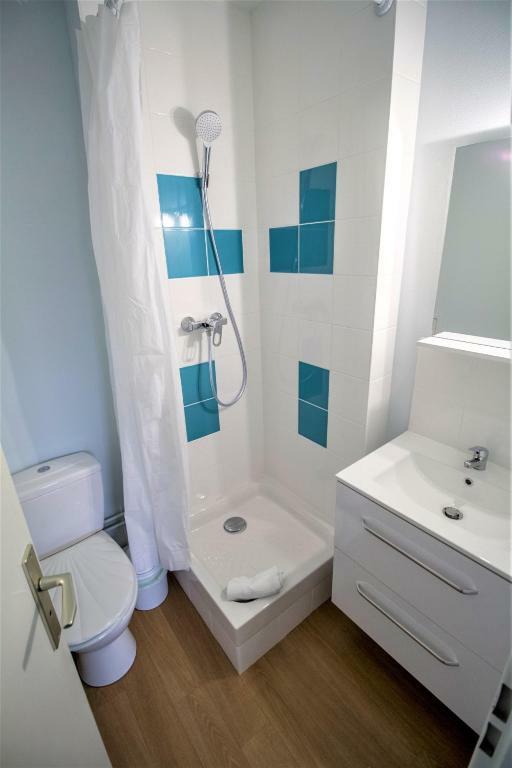 Features 2 bedrooms and a kitchenette with a fridge, microwave and coffee maker. This heated studio offers a desk, a flat-screen TV and a fully equipped kitchen. A private bathroom with free toiletries is also available. Résidence tout confort aux portes de la Cathédrale, à 2 pas des maisons de Champagne. Des logements chaleureux meublés et équipés, seul, en couple ou en famille. A 15 minutes à pied du centre ville, entourés des maisons de Champagne le quartier est calme est sécurisant. House Rules Appart Hotel Reims Champ De Mars takes special requests – add in the next step! 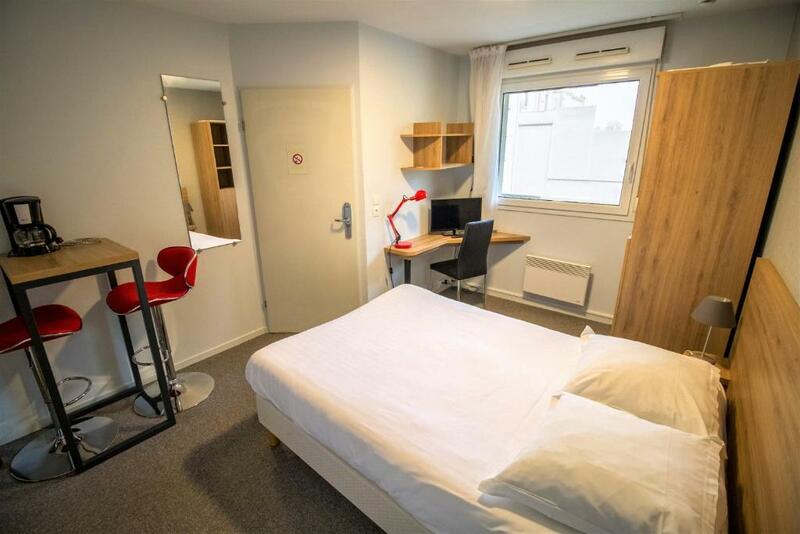 Appart Hotel Reims Champ De Mars accepts these cards and reserves the right to temporarily hold an amount prior to arrival. There was a spot on a blanket which was a bit annoying especially given that the stuff is gone after 18 so there was nothing to do about it. Check-out before 10:30 given check-in after 15 could be not particularly convenient. Should have some curtains or blinds, when the light was on, everything could be seen from the outside. No breakfast - having paid for us to have breakfast there wasn’t any. We didn’t see any staff and dining room was locked up so gave up. Apartment was clean and a decent size. We were told that no concierge or staff for the entirity of our stay. The response to staff was the preparedness of our rooms. Not excellent as other guests had had issues getting codes to enter. We were very nearly left out in the cold. We were sent no instructions on how to access our apartment even after emails requesting information. It was only due to luck and a kind stranger who knew the code that we were able to get the keys. The wifi does not work without a text message code, and because we had no sim and no help from absent staff, we were unable to get the wifi. All information in the room was in French - again with no staff to help - we did not know what was expected of us. Overall unsatisfied.